Discover the highlights of Udaipur on a private full-day tour. See the finery of the City Palace, and the Crystal Gallery in Fateh Prakash Palace, enjoy the greenery of the gardens at Saheliyon ki Bari, and learn about Rajasthani folk culture at Bhartiya Lok Kala Mandal. 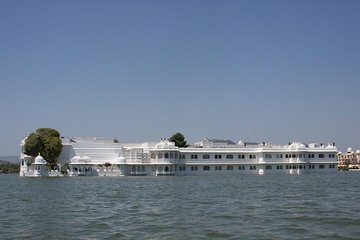 Have the option to check out the royals' classic car collection, then wind down with an evening cruise on Lake Pichola. Includes buffet lunch, private guide and vehicle, boat cruise, and some entrance fees. Start your day with morning pickup at your hotel in Udaipur. Travel in your private, air-conditioned vehicle to your first destination, the City Palace. Your guide shows you the palace grounds and museum, then takes you to Fateh Prakash Palace, a heritage hotel, where you can enter the Crystal Gallery (own expense), a collection of antique crystal objects. Have a buffet lunch at a local restaurant, then continue to Saheliyon ki Bari, a lavish expanse of manicured gardens next to Fateh Sagar Lake. Next up, visit Bhartiya Lok Kala Mandal, a cultural institution that promotes Rajasthani folk culture. Have the option to stop at a vintage and classic car collection that includes old Rolls Royce, Cadillac, and rare Mercedes Benz cars and limos that belonged to the Mewar royalty. Take a leisurely evening cruise on Lake Pichola before your tour ends with drop-off at your hotel.